I love these old sideboards and come across them from time to time. 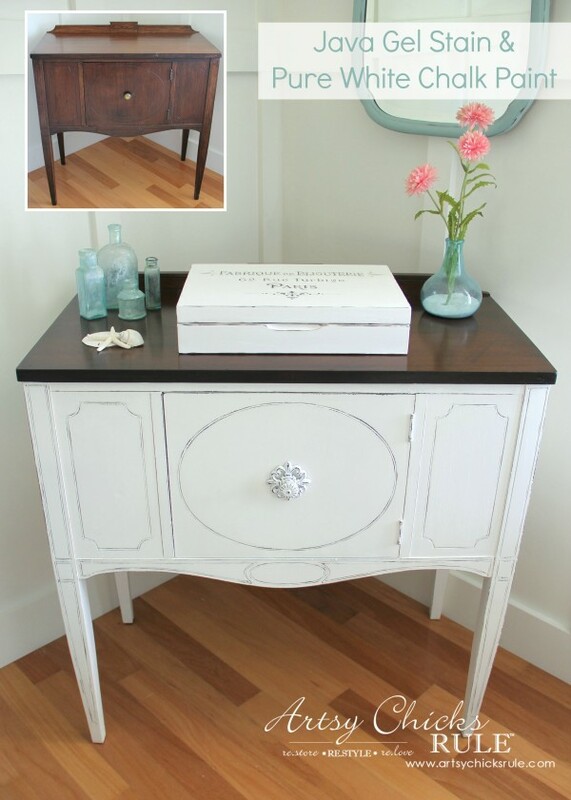 This sideboard makeover is classic and perfect for any style. 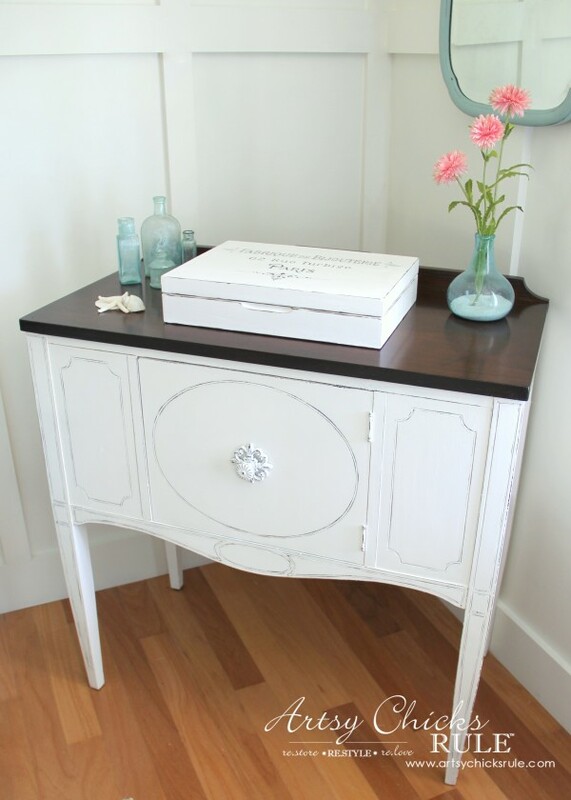 Today I’m sharing this sideboard makeover, inside and out! I found this old sideboard at the thrift store back in September. It sat…and sat some more before I finally decided how I wanted to paint it. 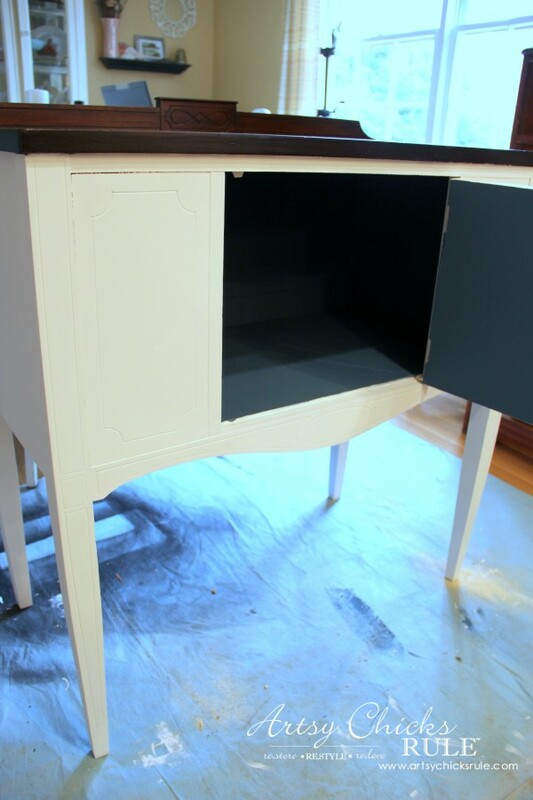 I had plans to do a sideboard makeover and add some sort of embellishments to the door fronts but changed my mind for a more simple makeover instead. 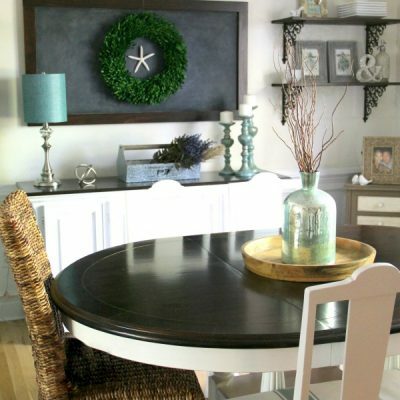 Our theme for this month’s “Themed Furniture Makeover” is “distressed”. I had planned to distress this piece very slightly anyway so decided to share it today for the tour. 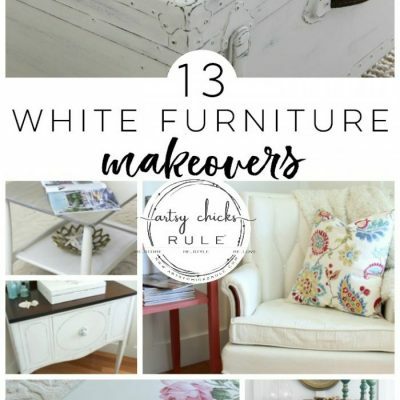 For those of you that may not know, some of my blogger friends and I get together every month and create a furniture makeover surrounded by a theme. You can see all of the months we’ve done so far here —> “Themed Furniture Tour“. It’s great because it really gets the creativity going! I distress quite a bit of the furniture I paint, not all, but a lot. Here is what I distressed…. If you follow my Artsy Chicks Rule Facebook page or Instagram, then you’ve already seen a bit of this piece already. I always share things over there while I’m working on things. Sometimes I even ask for advice! I asked whether I should paint that raised back wood piece on the top. Obviously I didn’t and went with stain! I had originally thought I’d paint it but then I was really liking the way it looked stained. So I wasn’t sure which to do. 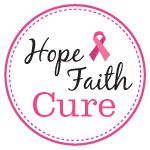 I’ll include affiliate links below when possible. You can see my disclosure, here. The finish was pretty awful on this one so it didn’t really hurt my feelings to paint it. But I knew I wanted to keep the top stained…a nice, dark shade. 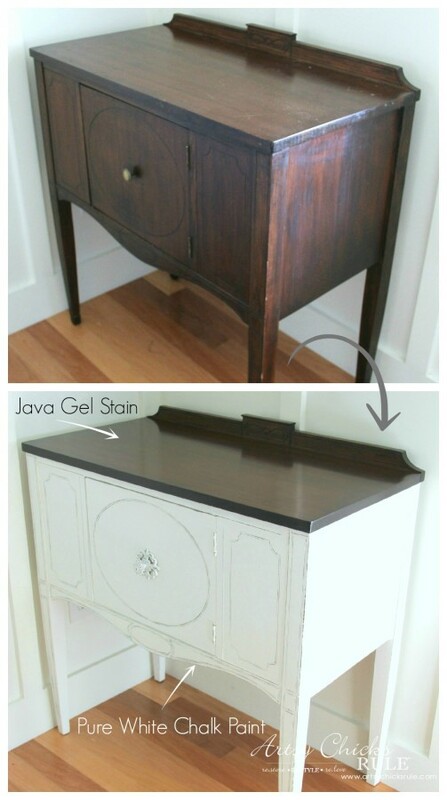 This sideboard makeover was a pretty simple makeover really. 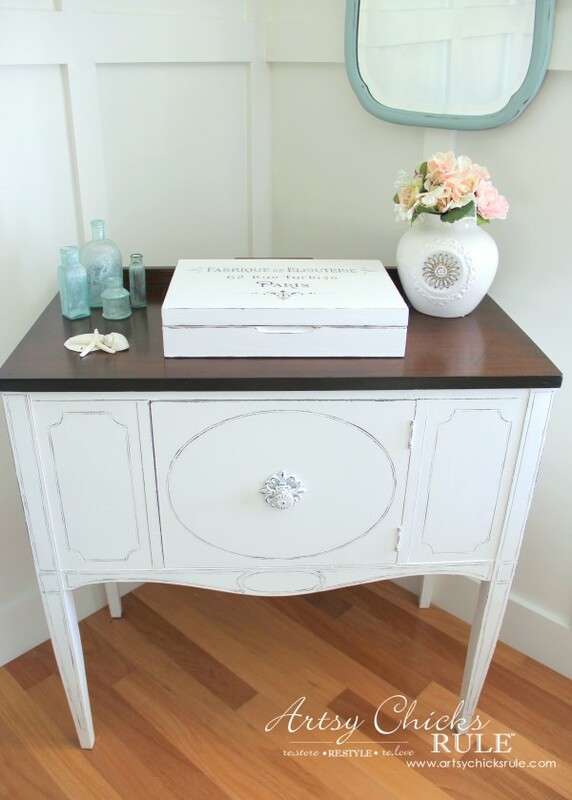 I used “Pure White” in Annie Sloan Chalk Paint for the base. But we are in the home stretch now! Woohoo!! 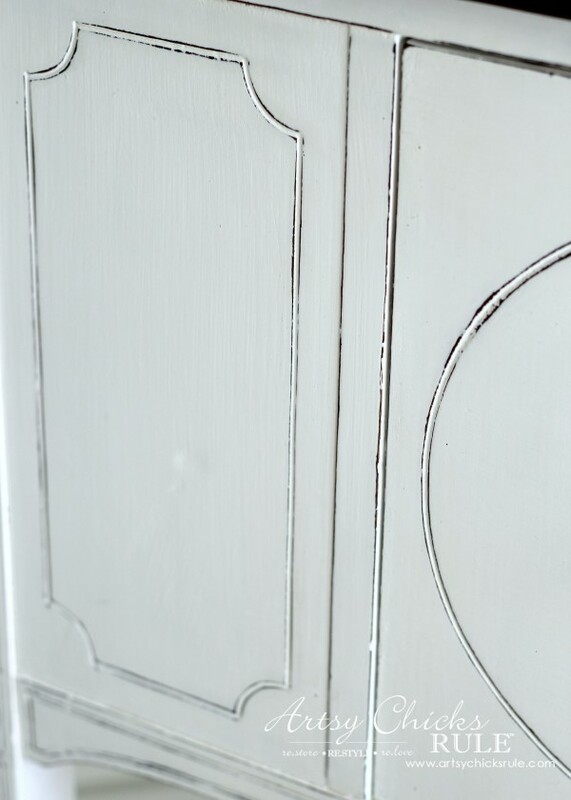 A little Aubusson Blue Chalk Paint when you open the door. Java Gel Stain by General Finishes for the Top. Lightly sand, just enough to rough it up. No need to remove the entire finish. Clean well and apply the Java Gel. Wipe away the excess and let it dry for about 24 hours. Then either apply a second coat if you want it darker or apply your top coat. And that oh so lovely Aubusson Blue for the interior for a fun surprise of color…. And just look at how the Java Gel made this top look. I used one coat and let that dry for 24 hours before applying a top coat of High Performance Top Coat. I used two coats of the top coat. I distressed only very lightly. I went around all of the edges of the detail on those doors and legs to bring it out. Much better than the photo above where it was lost in the paint (and the stain too). Now you can actually see it. 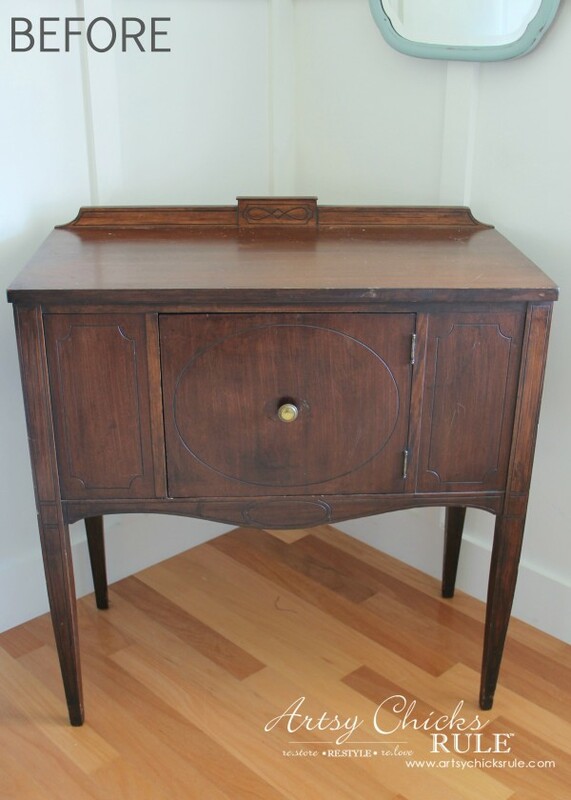 The sideboard did not come with it’s original hardware. 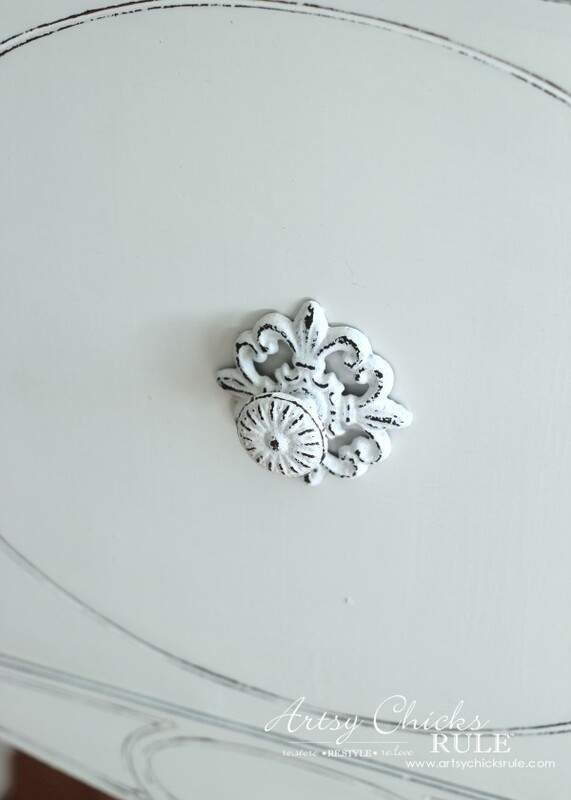 You could tell it was an oval piece and probably looked like this hardware I used on this old dresser. But someone changed it along the way just like they had on the dresser I linked above. So I painted, distressed and put this pretty on. It’s the same one I used on my “French” styled estate sale sideboard. As a matter of fact, I’m loving this new sideboard so much, I’m considering replacing that one (I just linked above)…with this one. 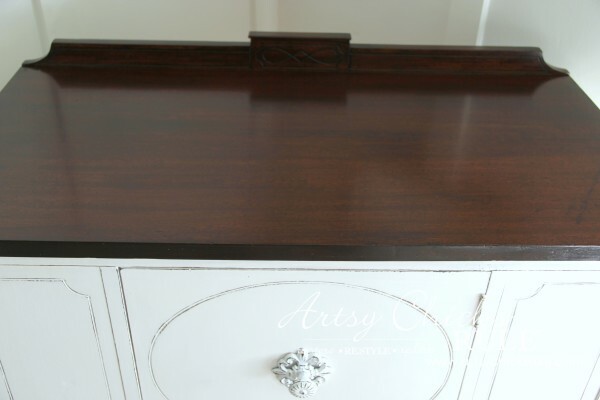 I just adore that dark wood Java Gel top & clean white Chalk Paint base. I’m wanting to repaint the “yellow-y” looking furniture I have to make it more of a “white, off white” instead. Crazy, I know, but what can I say? See the little French box there on top? I have a post coming up on that tomorrow so be sure to check back for that. 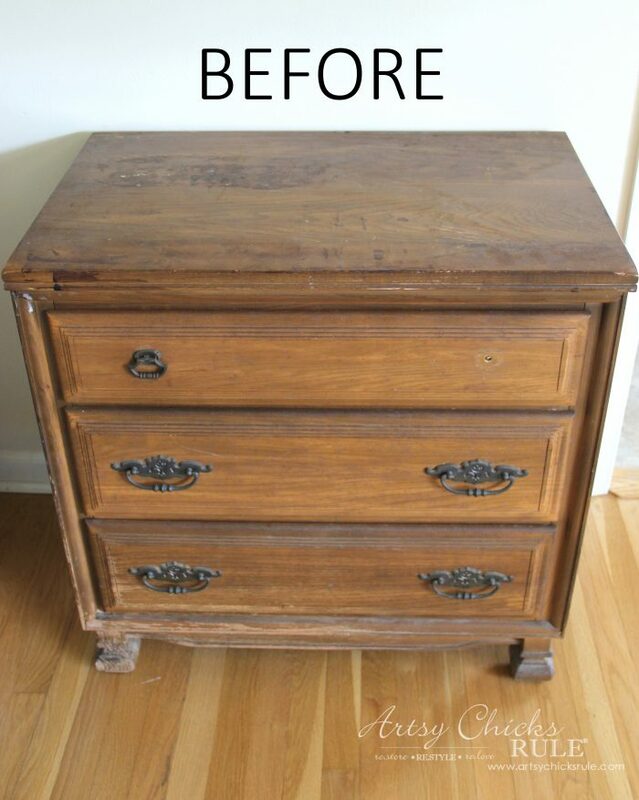 Edited to add this post I wrote about the Pros & Cons of using Chalk Paint for Furniture, see it >>> here. 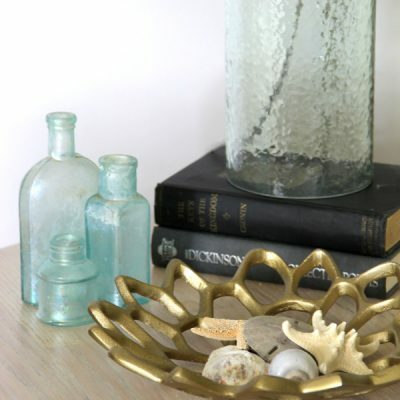 I just love the mix of French Country infused with a bit of coastal, cottage-y style. Teals, blues, whites, woods and a touch of pink. 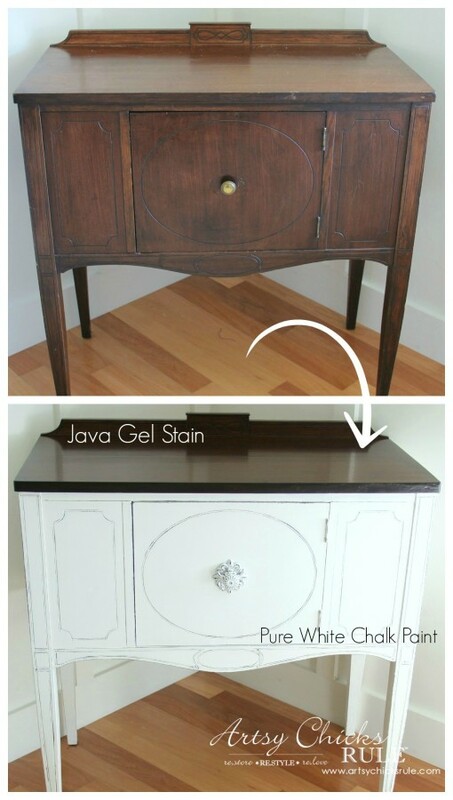 PIN this sideboard makeover to save it for later! 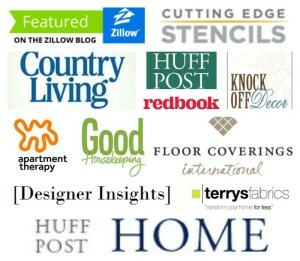 Alright, now it’s time to take a look and see what my friends “distressed” this month (they are below)! Enjoy…and I’ll see you tomorrow! 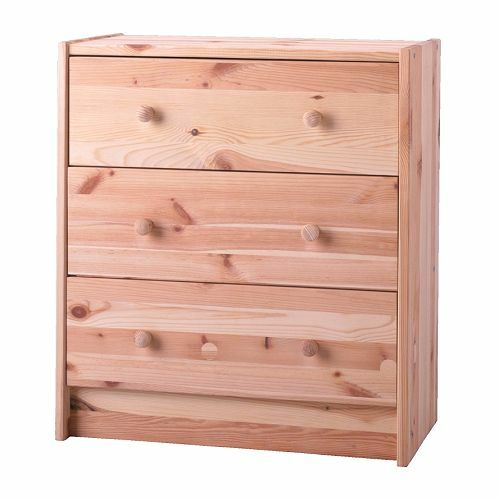 I have a piece of furniture very similar to yours. 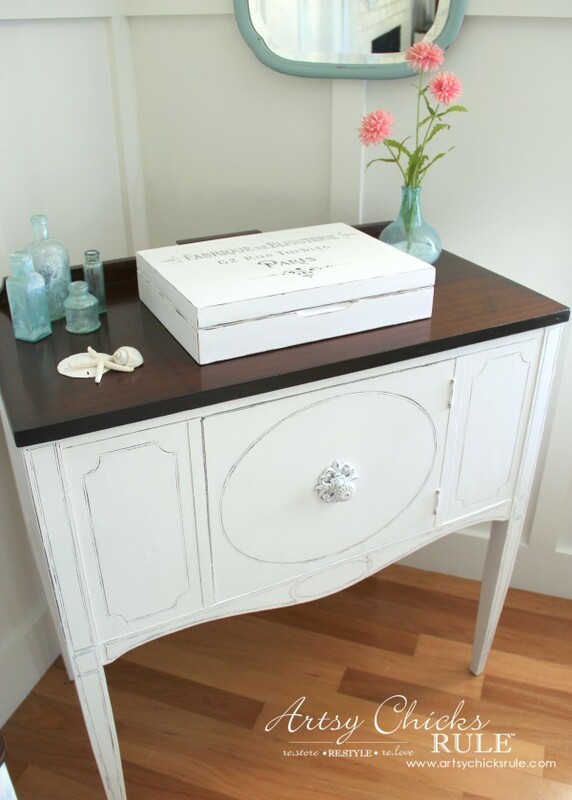 I painted it in an off white with little distressing and I use it in my guest bathroom for storage of towels and such. I love how the stained top looks on yours. I am in the process of staining the top of a buffet/server with the Java gel stain. 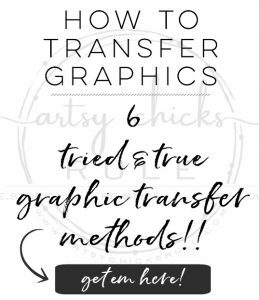 The directions tell you to apply then wipe off, is this what you did or did you just apply a coat and NOT wipe it off. I am thinking that if you like the look then do not wipe it off. Can you please tell me what you did so that I can do the same to mine as I think your top looks really nice. I really appreciate an advise you have to offer. I love your work and continure to follow your blogs. Yes, I applied it and then came back over it to remove the excess. No you really should wipe off the excess. Then you can let it dry for about 24 hours and apply a second coat and do the same. (If you want it darker) Then let it dry again and apply your top coat. 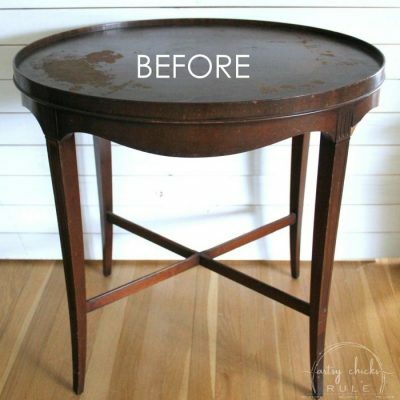 That looks stunning, I would like to do a half moon table, where can I get the Java Gel from. Thank you Debbie! :) You can get it from a store called Woodcraft if you have one close by. I am also going to edit this post link so others can find it too. 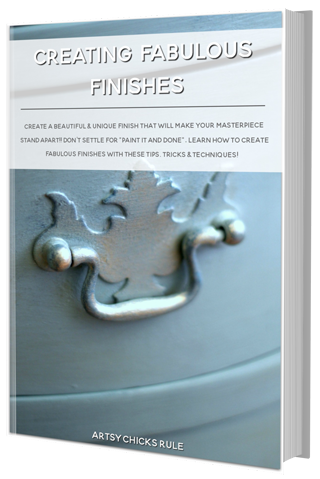 Did you have to sand the top before using the Java Gel or can you put it over the existing finish? It looks great! I love the contrast too. Beautiful! Quick question about the “distressing.” It looks like you distressed around and in the “grooves” of this piece. Is that done with paint or sandpaper? Directions, please. I think you made the right choice on the back piece it looks great! 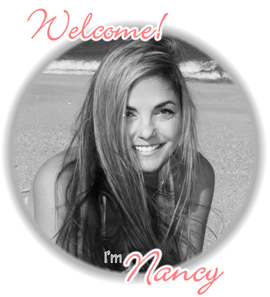 It is stunning Nancy! 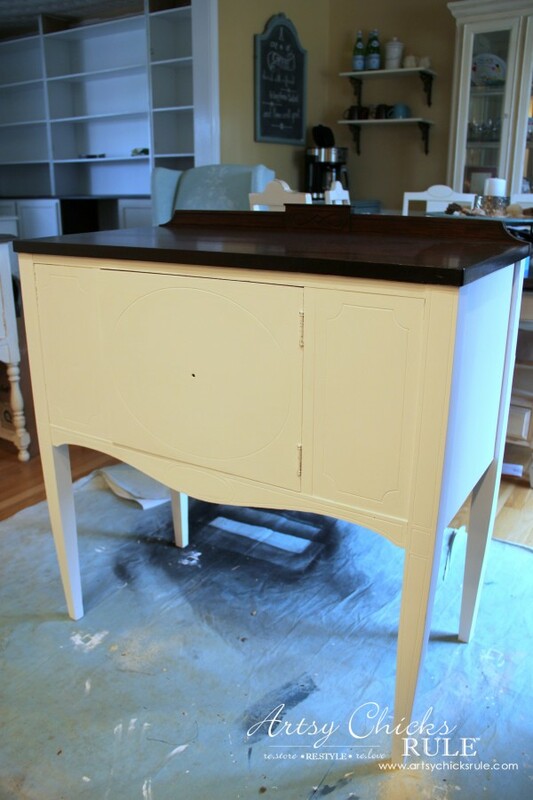 I love the gel stained top against the pure white chalk paint. The Aubusson Blue surprise inside is perfect. But I have to say the gorgeous hardware you added is perfect – like the pearls on the little black dress! I don’t blame you for thinking about keeping it. Oh I love that analogy!! That’s perfect! Thank you Christy! Nope, I applied with a regular bristle brush this time. i have a question . do you aply it in a special place?? like a tent?? or similar?? becaus i’ve used one product with poly , but the surface at the end was left with some dust particles .. this product dosn’t take the particles from the air?? I am so behind (again!) but I LOVE your new blog look and I. LOVE. THIS. PIECE!! Fantastic job my friend!! And thank you so much Andi!! Thanks Karen! :) I know…it’s a toughie!! I don’t know what to do. But can’t really keep both. Outstanding project! 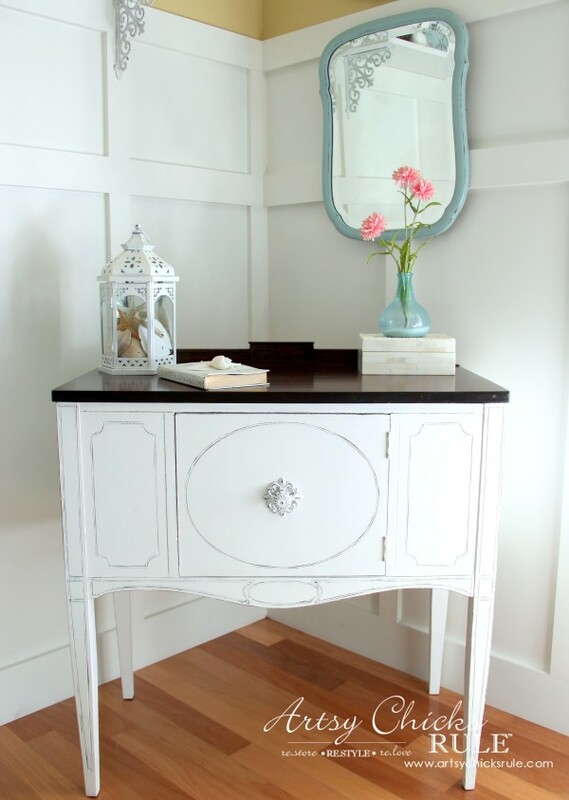 I love the white paint combined with the stained top and the blue interior is the icing on the cake for this piece. I finally purchased some General Finishes Java Gel stain and also top coat after seeing some of your other projects and I can’t wait for an opportunity to use it. 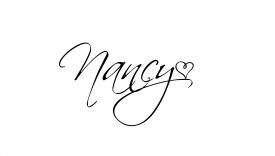 Nancy… I can’t believe how awesome your piece came out! Well, of course I can, you always rock a makeover…but, I wouldn’t have imagined the end result could be as pretty as it is! Your also motivating me to try the General Finishes product line! Beautiful job!! Thanks Wendi! :) Oh yes, do! It’s a fabulous line of products…all of them! Love how all the details showed up after distressing. The java gel made all the difference in the piece. Very pretty. Thanks Michelle! :) Love how they show up after painting…and are many times lost in the stain! Hi Meegan! :) Thank you!!! Oh you do! :) It’s great! Thanks so much Jeanette! I just love the piece. I have never used Java gel, but now I am definitely going to have to try it. 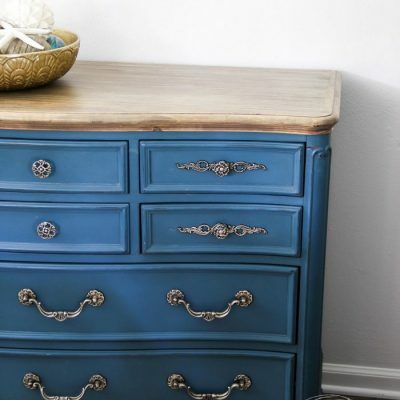 i do a lot of furniture painting and refinishing so this may have to be my next project. Great job once again. Oh yes, do! It’s really great stuff!! It’s gorgeous!! I love java gel too! 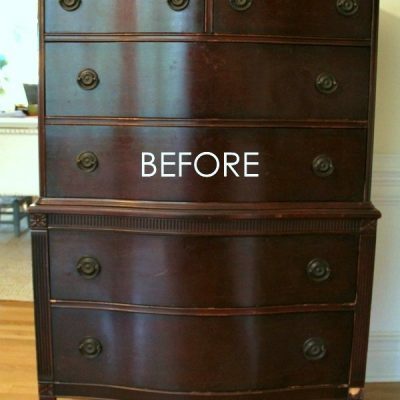 This is a beautiful transformation, I love that you kept the top wood and that inside is painted a beautiful blue. Stunning! nancy, i have a piece that I want to paint just this way. 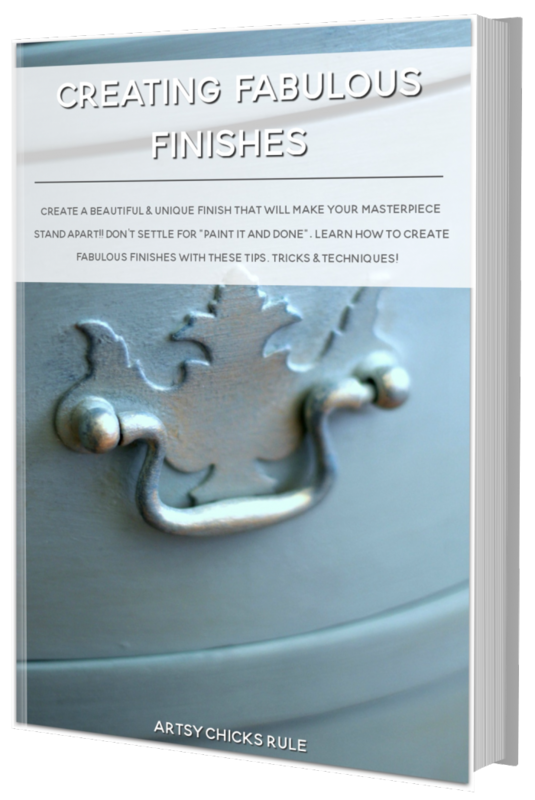 Have heard so many praises fo General Finishes gel stain. My question is my piece has been imported from a tropical location. I’ve had it many years, and no shrinking/structural changes have occurred… BUT the table top is wood that is glaringly different tones: One is a dark orange-brown, and the other is blonde-brown. Will I be able to even out the tones on this table top working wit GF gel stain? I would really appreciate any comments you would have… Thanks! I think you will be most happy with that result instead. Thank you! I am o.k. with that, as it is just bare wood now, but I’ve had limited experience staining, with varied results. What kind would you recommend for a dark finish like the G.F.? 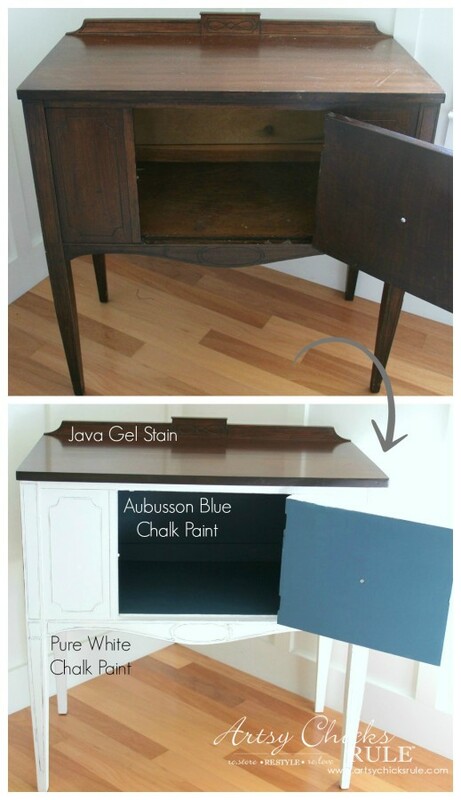 Or you can still use the Java for an even darker finish. Be sure to use a wood conditioner (on both) beforehand though for even coverage. Love this piece and thanks for the opportunity to see the how great the Java Gel looks. I read lots of bloggers and a lot do not paint the insides of pieces. It is a piece by piece decision for me. But I think the painting the blue on the inside of this piece was the right decision. Now Im off to find the Java Gel here in Southern California. Any ideas?? I am the same, some get painted, some don’t! But I do love the fun surprise. Just found this piece and your re-do. 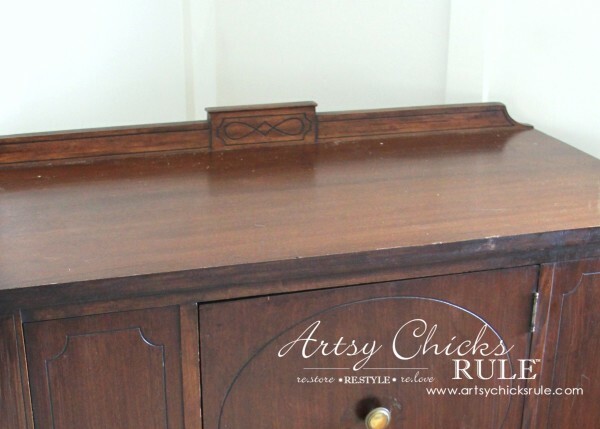 This is EXACTLY what I want to do to my dining room buffet – an old piece with some very rough areas…this will be the perfect thing to do to it! Beautiful. You are so talented! 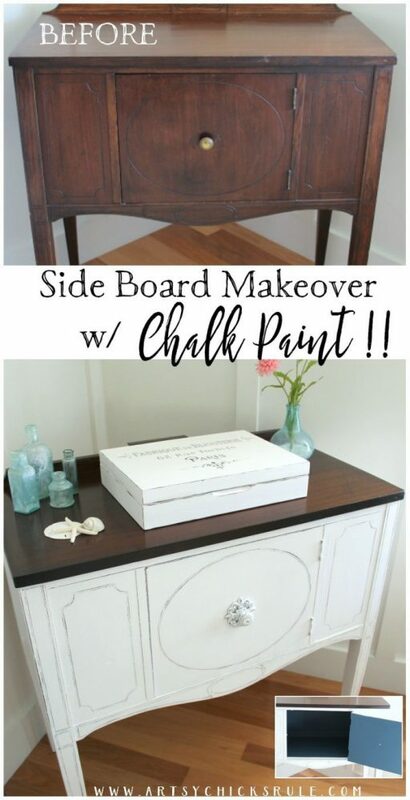 Did you use to make your own chalk paint? Mine turned out gritty. I see you buy it now. Do you ever make your own anymore? Aw thanks! I use pre made (I didn’t love any of the “make your own” recipes I tried). I think I did a piece or two but no, I never really used my own version of CP. Pre made is easier and more consistent. Hi – love this. Can you use that gel on a dining room table? I have a big farm table I’d love to darken the top. I Love it in white with the dark top. And that mirror over it–gorgeous! I recently found a similar piece on Facebook for myself and I’m going to do the same treatment. I LOVE ASCP Pure White. 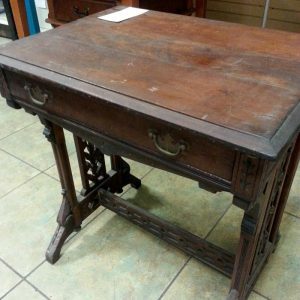 I did an old secretary in Old White that’s not selling. I wish I had used Pure White so it would work in my own house. I guess I could repaint it it, but I’d have to redo the french stripes and stencil I added. Grrrr! I love the new piece and looked back at the previous sideboard you did and think the new one will look even more amazing in your home.